During 2015 in substations SS Sevnica, SS Mokornog and SS Komen owned by Elekro Celje d.d. and Elektro Primorska d.d. (Slovenia) are delivered Line Differential & Distance Protection relays and Feeder Protection Relays for 110 kV / MV substations. 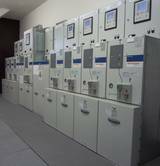 All devices are equipped with communication interfaces and protocols according IEC 61850. In all cases MMS services, GOOSE messages, NTP time synchornisation and FTP file transfer is implemented. In SS Sevnica and SS Mokronog relays are interconnected with station control system from ABB (COM600), while in SS Komen they are interconnected with station control system EpConv with SISCO IEC61850 OPC server. In substations SS Sevnica and SS Mokornog, relays send GOOSE messages to ABB relay of the REF family for load transfer purposes. The devices in SS Komen are put in regular operation in October 2015 and in SS Sevnica and SS Mokornog - March 2016.